When I arrived my first time in Karamoja, armed with a digital camera, a long-barrelled lens, and a large shoulder bag of equipment in tow, many of the locals eyed me suspiciously. Many, should I point my camera in their direction, would dodge out of the way as if I were aiming a weapon at them. In San Diego, when someone finds themselves in front of a camera, the reaction is usually to stop and smile, lest the photographer catch them in the middle of an odd facial expression (then tag their ignominy on Facebook). At first, it made sense to me that perhaps these Karamojong had superstitions that I was stealing their souls (I had previously read about this reaction in other tribal groups). But I eventually came to realize that most thought I was from National Geographic or some similar outfit and were either unhappy about being used as entertainment for Americans or (as many eventually made clear), they wanted to be paid since they assumed I was getting a handsome price for capturing their mugs. Hale wants to highlight in this fourth chapter the peculiar initial moments of encounter between missionaries and those they go to minister to. These first impressions, he says, are terribly important on both sides, and fraught with the memories, mythologies, and experiences that both parties bring to the table. My wrong assumptions were the product of earlier reading and anecdote, theirs were forged from past history. 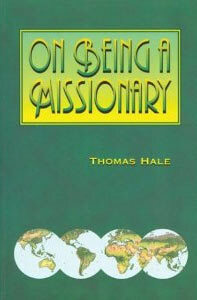 Both of us have our unique cultural sensibilities and, as Hale writes, missionaries need to keep this in the forefront of their minds when seeking to minister in a new and foreign culture. The key to this chapter is his assertion that love and respect are the keys to connection with those who we seek to minister to. When we cross cultural divides, we must do so as guests—displaying grace, thankfulness, and flexibility toward those who are our generous hosts. The question is often asked of me—are the missionaries in Karamoja worried about changing the culture? There are two sides to this question. The first is anthropologically driven, that is concerned with the preservation of a native culture and an antagonism toward remaking the Karamojong in the image of the West. The flip-side of this question is the desire to Christianize the cultural patterns of the people, thus eliminating the part of their culture that conflicts with the kingdom of Christ. The question is overwhelmingly complex, and beyond the scope of this posting, so I’ll try to limit myself to a few cursory comments on the subject. The Karamojong culture is, naturally, in a state of rapid transition. As formal, English-language schooling becomes more ubiquitous, the traditional language will fall into disuse. As industry increasingly comes to Karamoja or runs through Karamoja, Westernization will gain a greater foothold. The work of the missionaries comes into this complexity as they seek to weed out cultural norms that run contrary to the course of the Gospel. Such concepts as polygamy, alcoholism, the expectation of deception, and an attitude of shiftlessness are all prime examples of cultural facets that cannot coexist within Christ’s kingdom. In one sense, the Gospel taking hold in Karamoja means that the Karamojong culture, as it is manifest now, will no longer be recognizable. On the other hand, it is important that missionaries to the Karamojong are careful not to import their own cultural adiaphora into their Gospel teaching. Indeed, there are many cultural practices common in Karamoja that we don’t want to undo through Westernization. To name a few examples, the Karamojong are a very communal people. A large part of their identity comes through their family, village, and tribal relations. They show deference to their elders. They are extremely hospitable. I was caught in a village during a rainstorm and was invited into an older woman’s hut to stay dry. While there, she generously shared her mug of termites with me as we waited for the sky to clear. On another occasion, while I was walking though a village taking pictures, several people insisted that I take pumpkins and kasava roots with me as gifts. These are norms we want to be very careful not to stifle. As many blessings as Western culture has given us, we want to be careful not to forget that it also often promotes radical individualism, greed, and materialism. The task of every Christian, but especially of the missionary, is to live and encourage others to live as citizens of God’s kingdom, and faithfully (however imperfectly) discern those parts of our culture which draw us away from Christ. To accomplish well this task in Karamoja is an especially delicate task. Pray that we and those we labor with will be given an extra measure of grace as we seek to live not as Americans (or even Californians, as peerless as our culture is), but as denizens of the city of God.